All-in-one snow suits are back with a vengeance. And we are into it. There’s no denying that seeing a onesie on the slopes always brings smiles. Whether it’s a chicken costume, a vintage high-waisted 80s number or an eye-watering vision in neon, they are a LOT of fun. Why should adults be denied babygrows when they’re so damn comfy? 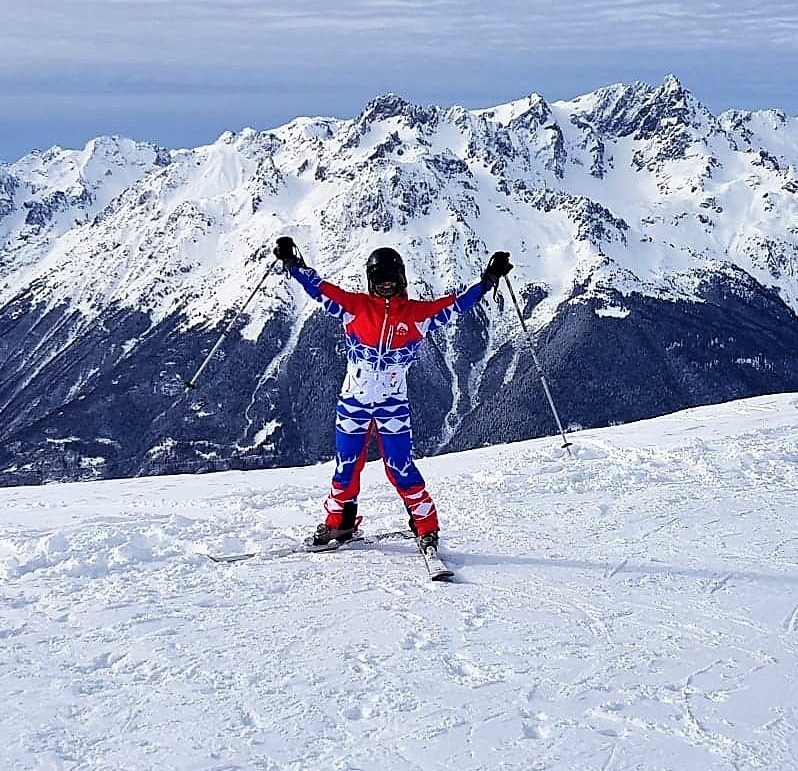 Over at Oosc (Original Old School Ski Company) their mission is to bring fun and colour back to the mountains, so we took the Scandi Slayer suit for a whirl on the slopes. Stepping out in the new suit I felt ready for anything the pistes could throw at me. But would it be warm enough? The temperature I faced was -6 but it felt like -25. The advantage with a one piece is that you keep the heat contained inside the suit and reduce the chance of snow or ice finding its way up your back. The suit kept me warm, but not hot, so I would suggest serious layering in mid-winter. The Oosc suits have a spacious breast pocket which is perfect for storing a phone, suncream, lip balm or a naughty hipflask. It has matching pockets on the upper leg and the left arm has a ski pass pocket plus wrist gaiters. Other saucy designs on offer from Oosc include include 80s patterns, rainbows, flamingos and multi-coloured leopard print with cheeky names like Nuts Cracker, Balearic Baller, Fresh Prince and Club Tropicana. And for the disco enthusiasts, Oosc suit ankles can unbutton for EVEN MORE FLARE. Technical spec aside, the biggest selling point for me is that the Oosc suits are unapologetically lairy and fabulous, whilst keeping you warm at the same time. They are for skiers who don’t take themselves too seriously and want to stand out on the piste then lap up the attention at après. They make you very easy to spot on the slope - I spotted not one but TWO other Scandi Slayers in Alpe d’Huez. For anyone keen to rock the look, it makes sense to invest in a onesie that’s technically equipped for the mountains, instead of freezing in your auntie’s vintage suit… no matter how jazzy the racing stripes are. Sustainability enthusiasts will be happy to know that as a company, Oosc is friendly to the environment. It made the decision to overhaul its entire manufacturing process in 2018 to ensure only the finest recycled polyester is used for outerwear and organic cotton for soft goods. Protecting the environment also extends to anyone involved in the process, so production is compliant with the FWF Code of Labour Practices. Ski jackets and ski suits are made with 51% recycled polyester from plastic bottles and you can learn more about the full process here. We’ve got a lot of time for these sustainable credentials and any customer will be happy to know their money is helping towards a more sustainable future in snowsports.